Building a treehouse for Brian and Brittney Kelley on their lush property near Nashville, TN was a dream come true. The property holds special meaning for the couple because they were wed there on a point overlooking the forest. Brian (who makes up one half of the country music duo Florida Georgia Line) fell for the treehouse life as a kid, when his dad built him a backyard treefort. Brian and Brittney longed to bring a bit of that childhood treehouse magic to their Nashville home. They asked Pete for a treehouse with ample space for creativity and relaxation. Pete took the couple's wishlist and created a grown-up treetop retreat replete with a recording studio, writing desk, large windows, and bedroom loft. It's the perfect place for Brian and Brittney to dream up new tunes, gather with friends, or quietly admire the forest views. We usually build ramps and staircases that lead up to treehouses, but in this case the location necessitated a long series of bridges that lead gently down the slope to the treehouse. These bridges connect the treehouse with the viewpoint where Brittney and Brian got married, and also lead from the viewpoint to their house. The final stretch of bridge is designed to move with the treehouse - that way, it won't crack or break when the trees sway in the wind. Dark barn wood siding enables the treehouse to blend beautifully with the surrounding black oak trees. The flat roofs are covered in waterproof vinyl. Working on a steep slope in the dense Tennessee forest was a bit challenging. To keep from carrying heavy materials down the incline, the crew installed a temporary high line pulley system to "fly" beams and walls over to the structure. A series of heavy limb TABs in steel jackets provides secure support for the prodigious treehouse. It roosts 20 feet high in three tremendous oaks. The downstairs holds ample hangout/recording studio space. Long windows provide sweeping views of the verdant forest. Cork lines the walls of the vocal booth and continues into the kitchenette. Upstairs is a bedroom and bathroom. The circular bed was custom-made using old whisky barrels for wood. Solid wood paneling and floors create a natural, warm vibe. The crew added this slab writing desk for Brittney. The spacious deck is bordered by hog wire railing. Pete worked with Brian's dad to acquire wood from Brian's childhood treefort. Pete then crafted this archway from the old treefort wood. It's a simple way to bring character and sentiment to the new treehouse and connect it with Brian's original one! 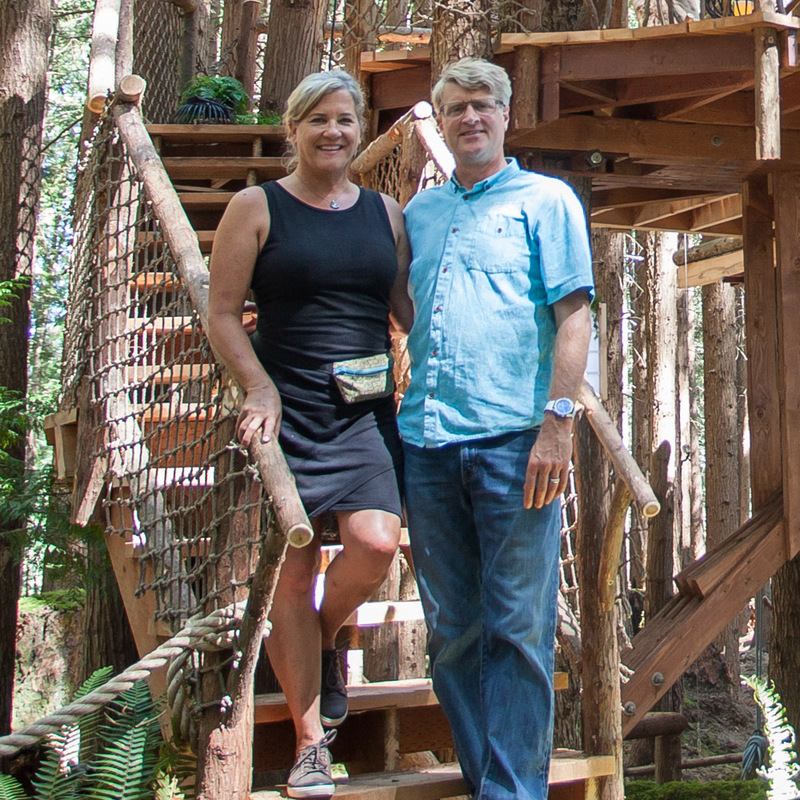 It was a real pleasure to bring the Kelleys' treehouse dreams to life. Thank you, Brian and Brittney, for a fun and memorable build! We wish you a lifetime of happiness up in the trees. Stay up-to-date on all things treehouse by following us on Instagram and Facebook and subscribing to our mailing list.